The Door is Open … Come on in! January has been an interesting month for me professionally as a teacher when it comes to peer observation. 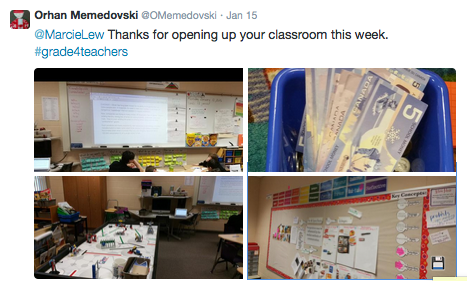 I have always been very open about what happens in my classroom, sharing with my PLN on my blog and Twitter. As much as possible, during the school day I try to physically keep my classroom door open so that colleagues feel free to come in my room. I think a lot of people have great intentions about observing peers (including myself), but actually finding the time to be able to can sometimes be a little more difficult. In terms of the priority list, there are often things that need to be done immediately that seem to find there way in front of peer observation. This month I have had two teachers come into my classroom to observe both with slightly different scenarios. The first person to come in was Canadian teacher who is currently teaching at a PYP school Australia who was home in Canada over the Christmas holidays. As the school year is different in Australia due to being in the Southern Hemisphere he was still home when Canadian schools returned back to school being in session. The second person to come in is a Masters candidate from the local university who is studying inquiry practices in the classroom. It has been interesting to reflect on how both of these opportunities have helped me to continue to grow professionally. As we are a fairly new school to the PYP programme, it was the first time that I have had the chance to have another teacher who teaches within the PYP visit my classroom. As the PYP is a framework not a curriculum, there are many different ways to implement the program that align with the programme. Throughout the two days of the visit it was interesting to compare the techniques that I was using to what the other teacher was using. One of the first observations that the visiting teacher made was that I am the only Grade 4 teacher in my school which automatically impacted the amount and type of collaboration that was happening within my planning and teaching practices. As a result, my collaborative planning tends to occur more with the specialty teachers vs. grade level partners. Over the course of the two days, we had a number of conversations about differences in the ways we were implementing the PYP. Overall, there were lots of similarities – including a number of the same units at similar grade levels. The second observer in my classroom has been a Masters of Education candidate from the local university studying inquiry practices. As Masters of Education programs in Canada are generally more research based (not as a means to gain your teaching qualification) this observation block does not include ‘student-teaching’. One aspect that they have been really interested in is the actual process of planning for inquiry. As a profession, having to explain what you are doing and why really helps you to better understand your practices. It also forces you to be open and honest about if there are better ways that you could be going about achieving your goal. Although these observers have been very different in their purpose, both have contributed to my professional growth. I would encourage you if you have the opportunity to open your classroom doors to observers but also to try and find time to go and observe your colleagues and members of your PLN.